Following the strike embarked upon on November 4 by the Academic Staff Union of Universities (ASUU), the Federal Government of Nigeria, has again resumed negotiations with the union in a bid to bring an end to the strike. Students of public universities have since the strike been at their homes, with their academic needs stalled as ASUU has maintained that the strike won’t be called off until its demands are met by the federal government. 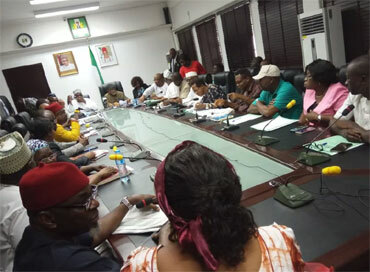 At the meeting which began on Monday evening, at around 5pm, had in attendance, the minister of Labour and Employment, Dr. Chris Ngige as well as a delegation of the striking lecturers. Some of the conditions which ASUU has given the Federal government to call off the strike include that FG releases N50 billion to demonstrate its commitment to the revitalisation of the universities. This is in following the MoU signed by both ASUU and FG in 2013 wherein the federal government agreed to pay the academic body N1.3 trillion as part of the funds for the revitalisation of the universities. Although the MoU had stipulated that the payment be made in tranches of N200 billion in 2013; N220 billion 2014; N220 billion 2015; 220 billion in 2016; N220 billion in 2017 and N220 billion in 2018, only N200 billion was released in 2013. Meanwhile, at the resumed meeting today, Dr. Ngige said the meeting is aimed at bringing the strike to a halt. Also, the ASUU President, Biodun Ogunyemi, said the union hoped the federal government would do the needful to resolve the strike.